Noting that in this current age, ‘there is a mood, an insistence, that the most important thing for each of us is to live by the strength of our own convictions’. There is moreover conflict ‘in the air, not dialogue; hostility, not willingness to accommodate and talk’. Christmas, which in the words of Pope Francis is ‘the feast of faith’, proposes an alternative: ‘Yet if we are willing to bend down a little and peep into the crib, then a different pathway opens up. It is, first of all, a pathway of the heart, for that’s what babies do. 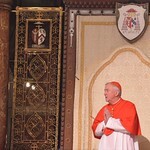 They change our perspective, bringing us to see things differently,’ the Cardinal said. The birth of Jesus, ‘the greatest of gifts, coming into the history of our world in an event of universal appeal, as a new born baby,’ offers to ‘all, without exception, a hope beyond all hope, and a love beyond every limitation’. This gift of Jesus, the gift of Christmas faith, is ‘not the cold truth of logic, nor simply of empirical evidence, as our culture likes to demand. But this is a truth that emerges when our hearts are stirred, not so much in the privacy of an individual experience, but carrying us out of ourselves into the harmony of a whole community,’ he added. He prayed that this Christmas may ‘renew in us the green shoots of hope and generous love, even in the poverty of our lives’.